The author describes this book as being like a tapestry into which the story of a family or a nation is woven. This is an apt description. The people focus is on the Nona family, Assyrians living in Iraq. The period covered is from 1915 to 1933. The author takes us through a tangled web of politics and intrigue, which ravaged the area and tormented its people. It is made all the more gripping and touching as it traces the Nona family through its joys and its tragedies. We watch a young boy and the horse given him after a family massacre; how their paths cross and then overlap as the boy grows into a leader and inspires his people. The characters are beautifully defined and add color and sparkle to the tapestry. Heroism and sacrifice become a part of daily life as a nation, driven from its ancestral land, seeks a place it can call its own. This story is a lost part of history. Coming between two major wars, it overlooks the "smaller" battles and demonstrates how soon the world forgets the lessons war teaches us. This is a must reading for students of history and lovers of a good adventure story. Many tragic events punctuated the first third of the 20th Century. Each produced its victims, its heroes, its victors and its vanquished. Few have been more quietly relegated to the fading, unopened pages of musty history books than the final crisis of the Assyrian nation and the related pragmatically self-serving decisions of the post WWI powers that allowed — no, encouraged — it to occur. The sequence of the events has been more or less accurately chronicled by historians, typically as little more than footnotes about a roving band of little known and poorly understood people who inflicted themselves as embarrassing, painful, thorns in the sides of Great Britain, France, Turkey and Iraq. Until this publication, the human story of these proud, tireless, Assyrian people has not been told. Ivan Kakovitch was born in Russia in the 30’s. He witnessed the inhumanity inflicted by the Germans and endured the resulting hardships. At an early age, he watched, as in turn, Russia extracted its pound of flesh from the crumbling German war machine. The following decade saw him absorbing three more settings, languages, cultures and educational systems as he traveled to Iran and then, to France. After earning a B.A. in Fine Arts from the University of Paris, Mr. Kakovitch pursued his studies at the Graduate Schools of International Relations at The American University in Washington, D.C. and New York University. Mr. Kakovitch’s expertise in the areas of studies of the Soviet Union and the Middle East, plus his linguistic proficiency, made him invaluable as a writer-abstractor for the committees of both Houses of the U.S. Congress. Initially, Mr. Kakovitch began his career as a translator, then continued as an editor, teacher, reporter and writer. Later, he launched a pair of weekly newspapers. Author of an academic book in 1970 he continued on writing essays, articles, columns, editorials, political and academic works, among them, “The Assyrian Manifesto”, published December 15, 1974. 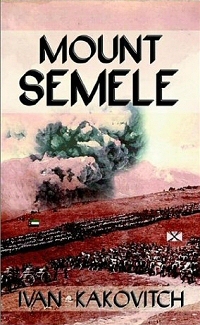 Known internationally as an able writer on important social and political topics, Mount Semele is his first major novel.